We know, we know. Why bother getting a tattoo if it’s something you’re going to want to cover up? That’s a fair point, but isn’t there something nice about being able to get your tats out when and where you want rather than it just being there all the time? Then there’s the whole I’m getting married and I don’t want it in the photos/if my nan ever sees it she’ll flip out/I hate it but I’m too scared to have it removed thing, you know? Fortunately there are non-lasery ways to cover your ink, at least temporarily. First things first – you gotta make sure your inked skin is as clean as a very clean whistle. Washing is an obvious one, but you should also get rid of any oil from the surface of your skin with a baby wipe to make sure your makeup sticks on good. Once that’s done, cover the area with a makeup primer to help the colour grab on tight. The trickiest bit of covering a tattoo with makeup is getting rid of a black outline; often it just turns blue instead of disappearing. The pros say sponge on a full coverage concealer using a ‘dabbing’ motion – i.e. laying it on thick. Follow that with a layer of concealer that matches your skin tone as closely as possible and shazam! Watch that tattoo vanish like it was never even there. For the final finishing touch, apply invisible loose powder to your freshly-concealed inkage; and don’t forget to pat, not sweep. Sweeping will make all the concealer you just applied come straight back off again. You might also want to spray it with some sort of makeup-setting magic potion to stop anything rubbing off on your clothes. Then off you go to your wedding/job interview/tea date with your nan. No one will be any the wiser. 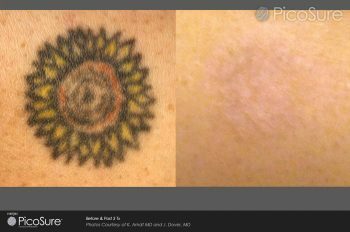 If you would like to permanently remove your tattoo, please visit our tattoo removal page.